You want something to change in your life but you don’t know how to do it. The harder things get, the harder you try. That’s because of how you have been trained. You are frustrated because you are not acknowledged for what you have done. The effort you have put toward your dream is the best you have ever given. The training that says the harder things get the harder you should work. The way you keep analyzing the results. It’s like pulling up the roots of a baby plant to see if it is growing. The judgement you place on yourself for not being good enough. Acknowledge you don’t know the answer and let that be enough. Keep putting your effort into your dream by taking the next step. This is my philosophy of fulfilling my dream. When I acknowledge the step I have taken today then I know I am fulfilling my dream because that was what I was supposed to do today. Do not lament on yesterday or leap into tomorrow. Your dream comes true in this moment as you take the necessary action. Pete Carroll, head coach of the Seattle Seahawks, has a lot to say about mindfulness and how it applies to life. First, let’s review...what is mindfulness? My definition is being present to whatever is going on in the moment without judgement. Sports coaches have been described as “my way or the highway” type of guys with a hard hitting attitude in a rigid system. 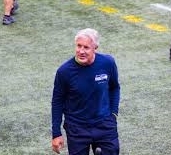 Pete Carroll has taken the concept of mindfulness and applied it to the creation of a winning football team with players who know how to be present in the moment. There is lots for us to learn using Pete Carroll’s philosophy about living our life. First, he coaches the whole person so that the player can bring his best strengths to the game. You can apply this by understanding your best strengths and bringing them to the game of your life. Second, he embedded the concept of being a competitor as a key to his philosophy in his coaching practice. His concept of competition is not about beating others but about being the best you can be. He develops his players to access and stretch into the potential he knows is inside them. Mindfulness training develops our ability to do just that...access our own highest potential and act accordingly. Third, Pete Carroll believes focussing on results is counter productive. He says when we focus outside ourselves we get distracted and lose focus on what is happening in the moment. Instead, visualize the results but focus on yourself and what is happening in the moment. He doesn’t win every game but he and his players are fully engaged in what they are doing. His level of success on and off the field is testament to his coaching strategy. I wonder how our lives would be if we took these ideas to heart?